Buchu-japchae is Asian chives stir-fried with meat and vegetables. It’s usually served in Korean-Chinese restaurants with Kkotppang (Steamed flower-shaped buns). When you go to Korean-Chinese restaurants this delicious stirfry is the most popular dish after jjajangmyeon (noodles in black bean sauce), jjamppong (seafood and noodle soup), and tangsuyuk (Sweet and sour pork). A lot of people think “japchae” means stir-fried vegetables, mushrooms, and glass noodles, but traditionally glass noodles (potato starch noodles) were not added. The glass noodles are a recent addition since the beginning of the 1900s. This recipe uses Asian chives, so I can say it’s a chive-focused japchae, but it also has a lot more vegetables in it, too and is made with dried chili pepper infused oil, which makes all the difference. The key of making delicious buchu-japchae is to stir-fry over very high heat so that everything keeps its moisture and shape and gets coated in the oil. Vegetarians can use mushroom instead of meat in this recipe. King oyster mushrooms are good. Choose several large mushrooms, slice into matchsticks and salt before using. And if you can’t find buchu you can use more green chili peppers – in that case you are making gochu-japchae (green chili pepper japchae)! When I posted my kkotppang recipe some of my Korean readers were surprised that I was making the buns at home, because you can get them easily in Korean or any Asian grocery stores. But homemade is better and fluffier, and most of all, it tastes better. Enjoy the recipe and let me know how your buchu japchae and kkotppang made you, your family, and friends happy. 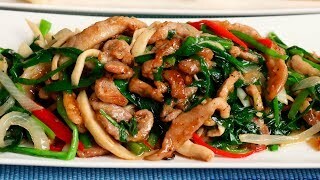 Combine the pork, 1 clove minced garlic, ginger, soy sauce, and ground black pepper in a bowl. Mix them well by hand. Cover and refrigerate until ready to use. Put the mushroom into a bowl and mix with a pinch of salt. Let it sit for 5 minutes until soft and a little wet. Squeeze out excess water and set aside. Combine 1 tablespoon potato starch and 1 table spoon water in a small bowl. Mix well and set aside. Heat the vegetable oil in a large frying pan over medium high heat. Add the green onion and stir for 1 to 2 minutes until golden brown. Turn off the heat and add the small dried red chili peppers to the hot oil. Stir for 1 minute until the peppers turn brown. Pick out the chili peppers and green onion with tongs and discard. Put the oil into a bowl. Take out the marinated pork and mix it by hand with the remaining 1 tablespoon potato starch. Heat up the oil over high heat. Add the marinated pork, spreading it in the pan. Cook for 1 to 2 minutes until the bottom of the meat turns a little crunchy and light brown. Turn the pork and cook another minute, splitting each piece of pork with tongs or a slotted spoon. Add the mushroom, onion, the remaining sliced (or minced) garlic, green and red chili pepper, and chives and stir for 1 to 2 minutes with a wooden spoon until the chives turn slightly brown and soft. Add the oyster sauce and stir. Stir up the potato starch and water mixture and add it to the pan. Mix well until well incorporated. Remove from the heat. Stir in the sesame oil and transfer to a serving plate. Serve right away with kkotppang. Uncoil one kkotppang and tear off a bit of it. Add some buchu-japachae to the middle of the bread, just enough for a mouthful. Wrap the ends of the bread around the buchu-japchae, and eat it all in one bite. Posted on Saturday, October 6th, 2018 at 12:16 pm. Posted October 16th, 2018 at 12:44 pm | Log in to reply. One of my favorite things to add to this is fermented black beans called douchi. Soak them first in water to remove some of salt. Posted October 6th, 2018 at 10:44 pm | Log in to reply. 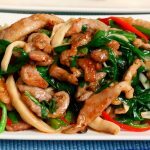 This recipe was originally posted on October 6, 2018 at 12:16 pm by Maangchi. The video was watched 394,718 times on YouTube & has 13,490 likes! Want to get my monthly letter? My monthly letter to my readers includes my recipe roundup, behind the scenes stories & photos, funny & touching stories from my readers, interesting Korean food links, and news about upcoming events!